Root knot nematode of onion is a pest that can drastically reduce the yield you get from your row of onions in any given year in the garden. They feed on the roots and cause plants to stunt and develop fewer, smaller bulbs. There are both chemical and non-chemical management practices you can use to reduce losses. Nematodes are microscopic roundworms that live in the soil, most of which do not damage plants. The root knot nematode is not one of those roundworms. It lives in the roots of a host plant, and there are four species that affect onions. They are able to infect onion roots when temperatures in the soil are over 41 degrees Fahrenheit (5 degrees Celsius). Above the soil, what you’ll see in root knot nematode of onion infections is uneven growth and stunted plants. The necks of bulbs will be thicker and the bulbs themselves smaller. The plants will mature later during an infection. The leaves may also yellow. 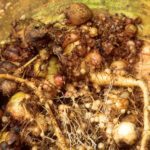 Underground, the roots will develop galls, swollen and enlarged areas of the roots. Root growth will be stunted, and you’ll see shorter roots than is normal. Controlling onion root knot nematodes starts with prevention. 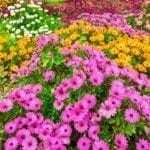 There are no resistant onion varieties, but you can use plants or seeds that are clean and nematode free. This doesn’t, however, mean you won’t get an infestation because the nematodes may already be in your soil. If you know that your soil is infested with this pest, you can use a pre-planting fungicide to fumigate the soil and reduce or eliminate root knot nematodes. This is generally considered to be an effective management strategy and is used in commercial onion growing. To avoid fungicides, you can try crop rotation or cover crops. Rotate in crops that do not host root knot nematodes, like grains and corn, or grow them as cover between onion plants. While using fungicide is the most effective way to manage onion root knot nematodes, using the non-chemical cultural practices of crop rotation and cover crops will reduce losses. These are worth trying if you don’t want to use chemicals in your garden.